Carpenitos "Handbook of Nursing Diagnosis" is the ideal quick reference for Nursing Diagnosis information. This handbook offers practical guidance on nursing diagnoses and associated care. Compared to Carpenitos textbook, the handbook is a quick-reference type scope of content, easy for students to use while in clinical, in the classroom or simulation lab. 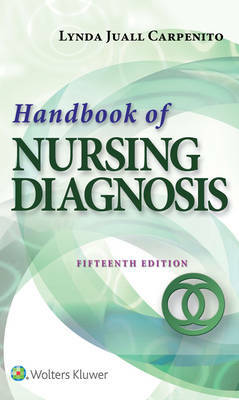 From goals to specific interventions, Handbook of Nursing Diagnosis focuses on nursing. It provides a condensed, organized outline of clinical nursing practice designed to communicate creative clinical nursing. It is not meant to replace nursing textbooks, but rather to provide nurses who work in a variety of settings with the information they need without requiring a time-consuming review of the literature. It will assist students in transferring their theoretical knowledge to clinical practice. This title is intended for nursing students to use through their curriculum. The 15th edition is organized in three sections. Section 1 provides an alphabetical reference to nursing diagnoses, including NANDA-I definition and Section 2 focuses organizes all the health promotion/wellness nursing diagnoses for individuals. Under each diagnosis, Authors Notes will elaborate on the clinical usefulness of the diagnosis. Additional foundational knowledge is included in each diagnosis: - NANDA-I definition - Defining characteristics (physiologic, emotional and cognitive) - Related factors including pathophysiologic, treatment related, and situational (personal and environmental) - Maturational: infant/child, adolescent, adult and older adult - Errors in Diagnostic Statements - Key Concepts & General Considerations - Special Population Consideration (Pediatric, Maternal, Geriatric, and Transcultural) - Focused Assessment Criteria - Goals (NIC/NOC) with Rationale - Interventions for Special Population Lastly, section 3 covers Diagnostic Clusters, which presents medical conditions with associated collaborative problems and nursing diagnoses, designed for easy reference in the clinical setting. The handbook differs from the main textbook because it doesnt go into the foundation for understanding nursing diagnoses, including care planning and concept mapping. The handbook only covers the NANDA-I diagnoses and collaborative problems.